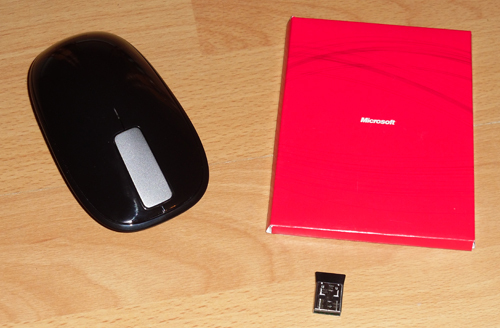 This week I got to play around with one of Microsoft’s new wireless touch mice – the Explorer Touch Mouse. It’s priced at $49.99, a highly competitive price. The other touch-based models available are the Touch Mouse, and the Arc Touch Mouse, which retail at $79.99 and $59.95 respectively. The mouse is compatible with both Windows and Mac platforms supporting Windows 7, Vista and XP (but not x64 versions of XP) as well OS X Tiger and up. The system requirements are fairly low, requiring simply a supporting OS, 100Mb of disc space (or just 30Mb on a Mac, although annoyingly, a reboot is required on Mac), and a spare USB slot. That’s it. The mouse functions as soon as it is connected on both Windows and Mac platforms, but to use the touch functionality or configure the buttons, Intellipoint must be installed. This was downloaded and installed (following a prompt) automatically as soon as I connected the mouse for the first time on my Windows machine. The touch scrolling actually worked on the Mac without installing Intellipoint, but the software is still required to configure the buttons, and it was not downloaded automatically on the Mac. 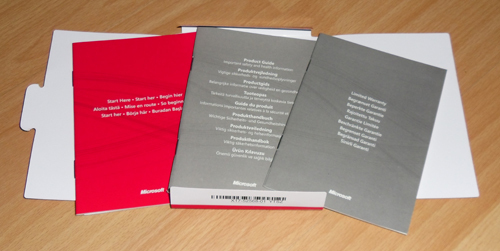 The packaging is minimal, unlike other manufacturers which seem to try to use as much packaging as possible, and contains just the mouse and USB connector, some decent (but not rechargeable) batteries and the usual documentation, with the various slips of paper and booklets this comprised of presented nicely in an attractive envelope instead of just being loose in the box. The mouse is a comfortable size, smaller than the mice I have used in the last couple of years (both gaming Logitechs), but quite nice to hold and move. 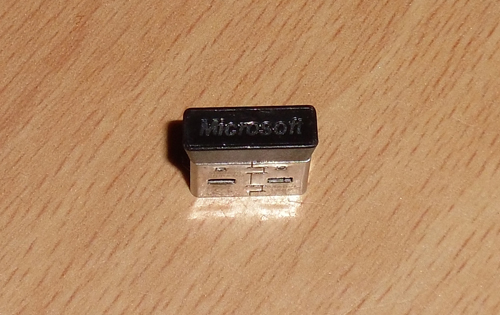 The actual physical dimensions are 63.4mm wide, 111mm long and 30mm high. The Nano Transceiver is 14mm wide, 18mm long and 4mm thick. When the transceiver is plugged in it sticks out from the casing by just 5mm, which is actually a whole 2mm of protrusion less than Logitech’s nano receiver, and is designed to be kept plugged in to a laptop even while the laptop is being transported in a bag. The mouse itself also features a stow port built into its body that the receiver can be kept in when you take the mouse somewhere and sits completely with the mouse. When Microsoft first launched the Nano Transceiver, there were reports that they quickly over-heated and malfunctioned. Whatever the cause of this issue, it seems to have been resolved as I suffered no temperature issues with the receiver at all. Looks-wise the mouse is sleek and attractive, with a glossy top shell and integrated left/right buttons. The bottom rim is coated in lightly textured soft-touch grip, and overall the mouse is comfortable to use. It is available in two colours; black and Storm Grey. There is also a very minimal power light on the top of the mouse, which I actually thought was faulty at first as it only comes on when the mouse is switched on and then fades away after a couple of seconds. 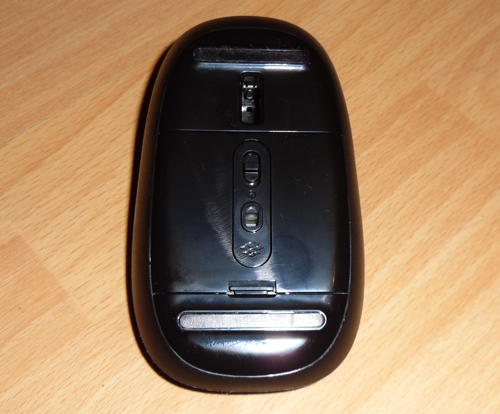 There is a power switch on the base of the mouse that can be used to turn it off not in use, which can prolong its battery life to a maximum of 18 months. I sincerely hope the batteries do last that long, although I think I’ll have to see it before I believe it! But it’s quite impressive if true. The touch pad is quite chunky and features a vibrating feedback mechanism to make using it a more tactile experience. It feels strangely almost like the free-spinning scroll wheel on a modern Logitech but not quite the same. It’s actually a little annoying after a while, and I much prefer it with the vibration mode disabled. The touch gestures it supports are both up/down and left/right swipes to scroll large documents vertically and horizontally, but Microsoft’s Intellipoint software must be installed for this to work and two or three-fingered gestures are not supported on this model. It also functions as 3-way button and all 5 buttons are fully programmable via the software. The mouse uses Microsoft’s Bluetrack optical technology, which allows the mouse to be used on a variety of surfaces with equal tracking responsiveness. It’s not a laser mouse, but the blue LED it uses is supposed to combine the best aspects of standard red LEDs and lasers – the width and power of an LED combined with the clarity of a laser. It certainly performed well on all the surfaces I’ve tested it on, including the bare wood of my desk, the shiny lid of my netbook, the roughly-patterned hard plastic of my chair’s arm rest and even carpet. Those of you that know me will know that I’m a big fan of FPS games, so how well does the mouse work in a gaming capacity? It’s certainly perfectly suited to low or moderate game-play, but for intense gaming a dedicated gaming mouse is always going to win out over a general-purpose mouse such as this. One thing I found was that the clicking the touch pad to use the middle-button function was not as responsive during game-play as the mouse I have been using up until recently (Logitech G500). But aside from that it performed well.